Let's just say that the web browser somehow became the #1 application platform And suddenly, a few sprinkles of jQuery magic and AJAX goodness might not be enough anymore. 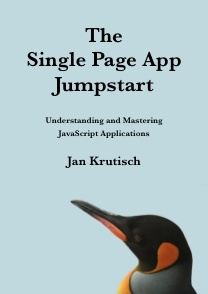 …is a series of books currently in the making by me, Jan Krutisch: web developer for life, technical writer and conference speaker and maker of things. Is a single page app the proper solution to your problem? What is the most fitting framework for your application? How do you keep your app maintainable and well-tested? What is the best way to deploy your app? What makes a good mobile single page app? How do you tune the performance of your app? This Series will answer all of these questions and more. Early access to the first book in the series is available via leanpub.com. Help me shaping this book so that I can help you shaping your future web appplications. Cover penguin photo by Bruce McAdam, used by permission. Seriously. I have no idea how "Phase Inversion" ended up on that list. Ask my editor. Wait, I don't have an editor. Wait, I should not have told you that I don't have an editor. Well, actually, I do have an editor, but it's a middle-aged penguin living at the edge of the arktis and he only has internet access twice a month. Let's just say it's not working out so great. I should have been more cautious when signing that 10-year contract. Oh well. That's probably why I became a web developer and not a lawyer.